It may seem obvious but sometimes it may be hard to keep up with – here’s why you need to speak in a positive tense when on sales calls. Sometimes it can feel difficult to stay positive when answering inbound phone calls on a daily basis from needy customers. The conversations may start to feel mundane when getting the same types of questions and requests, especially during busy times of year. Still—it is important to not turn to negative phrases, even when there are some requests coming from callers that you think maybe cannot be done. Here are 5 phrases that you may be guilty of using on your phone calls, and how to turn those around into a more positive-centric way to have a much better chance at gaining your callers’ business. Why: True, maybe you don’t know the answer to the caller’s question, but as a call handler, it is your job to be able to answer their questions and provide the best service possible as the first impression of your business. Why: Focus on how you can help the caller solve their problem—even if they make a specific request that your company cannot or does not do, let them know how you can help and be a good fit for them. Positive: Find a way to answer more positively. Why: Don’t keep focusing on what your company does not do for the caller—instead try to bring them back around to what your company does and what you can do for them. Why: Give realistic expectations and be mindful of the caller’s time. Why: Schedule conflicts will be a constraint that you will have to face sometimes. To overcome these with a positive mindset, state what you do have available that is still in the vicinity of what the caller was requesting for an appointment. Bottom line – Stay as customer-focused and positive as possible on all of your calls. Sure, there may be times when you can’t do exactly what is being asked of you by the caller, but there is always a way to turn that mentality around to a positive space. 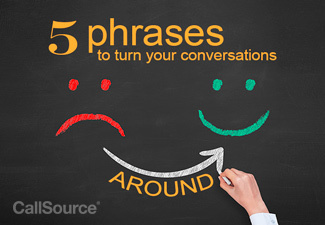 Start doing it now with these five phrases we’ve provided. Need more help on your sales calls? CallSource has Call Coaching to help you out. Contact us now to speak to one of our representatives about how Call Coaching can work for you.